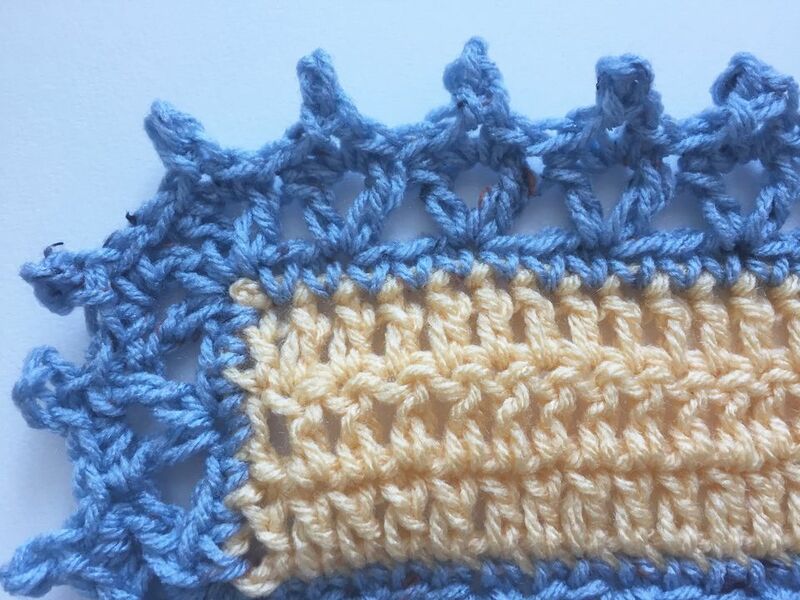 This free crochet edging pattern uses the v-stitch in combination with picots to create a really unique border. It works especially well around openwork designs, including those that include the v-stitch, but it is a versatile border that can be used around many crochet blankets and other projects. This crochet edging is a wide border, and you'll learn here how to work it around all four sides of a square or rectangular project, but you can also use it on a single side to enhance a design such as a shawl or a pillowcase. Here are a few things that you will need to know before beginning work on this crochet edging pattern. Note: You may adjust your yarn weight and crochet hook as needed when adding this border to different types of projects. Likely you will wish to match the yarn used in the project. Begin by joining your yarn in any corner of the project. Ch one. Work one sc in each st until you get to the next corner. In that corner, you will ch 2 to create a corner sp. Repeat the previous step until you have returned back to the starting corner. In that corner, you will chain two and then sl st to first ch to close round. Ch 3, [Skip 1 sc, (v st in next sc, skip next 2 sc.) Repeat sequence inside ( )s until you get to the corner. V st in next ch-2 space, ch 2, v st in same corner space.] Repeat instructions inside [ ]s 2 times more. Note: brackets [ ]s begin in the instructions above. Repeat from [ to ). Then repeat the sequence inside ( )s until you get to the corner. V st in ch-2 space, ch 2. Create another v st by using the 1st 3 ch sts you worked at the beginning of the round―dc in base of the first ch, then ch 1 and join with a sl st to the 3rd ch st in the round. Sl st in center of next v st.
To form the first v st, ch 4; the 1st 3 chs count as 1 dc, then work 1 more dc to complete the v st. Continue to work one v-stitch in every v-stitch until you get to the corner. Work 1 v st in ch-2 corner space, then continue working a v st in each v st.
Repeat from [ to ). Then repeat the sequence inside ( )s until you get to the corner. V st in ch-2 Continue working v-stitches into each v-stitch and corner. At the end of the round, use a sl st to join work to the 3rd sl st from the beginning of the round. Note: see Round 2 / Step 4 for reminder of where this is. NOTE: If you wanted to do something a little bit different with this round, you could crochet v-stitch shells instead of class v-stitch. After the third round (or after the second round if you have not chosen to add the additional round of v-stitch, you will complete this crochet border pattern with a round of picots. Each picot will be worked into each v-stitch as follows. Work a sl st into the center of the next v st. Note that if you used the option to crochet v-stitch shells instead of regular v-stitch, you will work into the ch-1 space at the center of the shell stitch. Sc in same v st, ch 3, sl st in 3rd ch from hook, sc in v st. Note: Those steps are what make a picot. This is one picot. (Sl st in space between 2 v sts, sc in next v st, ch 3, sl st in 3rd ch from hook, sc in same v st.) Repeat the sequence inside ( )s all the way around. When all the v sts have picots, end off. Note: Corners are worked the same as every other v-stitch. Finish off and use a tapestry needle to weave in ends.